Take a break from the city and head to River Rafting & Tubing and Bow Falls. Your cultural itinerary includes sights like Cave and Basin National Historic Site and Bankhead Ghost Town. Change things up with these side-trips from Calgary: Lake Minnewanka (in Banff) and Hot Glass Studios (in Canmore). There's still lots to do: steep yourself in history at Heritage Park Historical Village. For more things to do, maps, where to stay, and more tourist information, refer to the Calgary custom trip planner. Cancun, Mexico to Calgary is an approximately 9-hour flight. The time zone difference when traveling from Cancun to Calgary is minus 2 hours. Traveling from Cancun in June, expect nights in Calgary to be colder, around 9°C, while days are slightly colder, around 22°C. 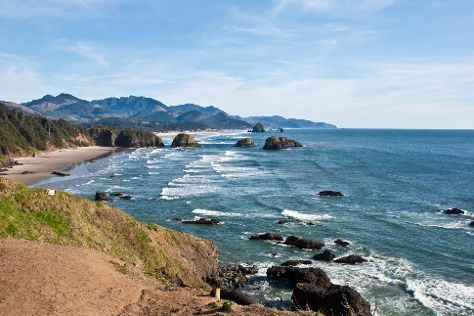 Finish your sightseeing early on the 5th (Mon) to allow enough time to travel to Cannon Beach. Cannon Beach is a city in Clatsop County, Oregon, United States. Start off your visit on the 5th (Mon): kick back and relax at Cannon Beach. On your second day here, browse the exhibits of Columbia River Maritime Museum and then take in the dramatic natural features at Haystack Rock. To find more things to do, ratings, maps, and tourist information, read our Cannon Beach travel planner. Explore your travel options from Calgary to Cannon Beach with the Route module. Due to the time zone difference, you'll gain 1 hour traveling from Calgary to Cannon Beach. June in Cannon Beach sees daily highs of 21°C and lows of 13°C at night. Wrap up your sightseeing on the 7th (Wed) early enough to drive to Newport. On the 7th (Wed), enjoy the sand and surf at Devils Punchbowl State Natural Area and then look for all kinds of wild species at Yaquina Head Outstanding Natural Area. For ratings and more tourist information, read Newport holiday planner. Traveling by car from Cannon Beach to Newport takes 3 hours. Alternatively, you can take a bus. While traveling from Cannon Beach, expect a bit cooler days and about the same nights in Newport, ranging from highs of 18°C to lows of 10°C. Finish your sightseeing early on the 8th (Thu) so you can travel to Glacier National Park. 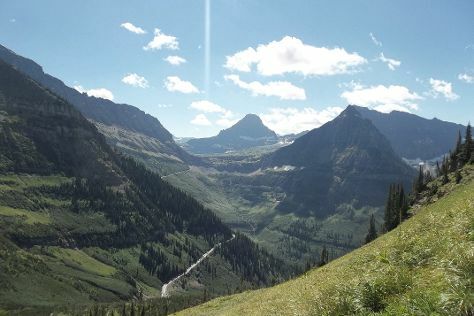 Keep things going the next day: appreciate the views at Logan Pass and then cruise along Going-to-the-Sun Road. For other places to visit, where to stay, traveler tips, and tourist information, go to the Glacier National Park trip itinerary maker. You can do a combination of bus and flight from Newport to Glacier National Park in 9 hours. Alternatively, you can drive; or do a combination of bus and train. Traveling from Newport to Glacier National Park, you'll lose 1 hour due to the time zone difference. Traveling from Newport in June, you will find days in Glacier National Park are somewhat warmer (26°C), and nights are about the same (8°C). Wrap up your sightseeing on the 11th (Sun) early enough to drive to Yellowstone National Park. Satisfy your inner culture vulture at Artist Point and Old Faithful. Step off the beaten path and head to Upper Geyser Basin and Yellowstone Lake. 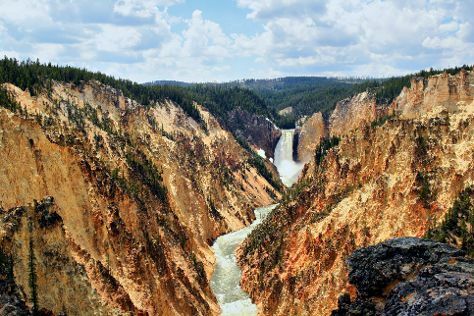 There's more to do: witness a stunning natural landmark at Mammoth Hot Springs and explore the stunning scenery at Grand Canyon of the Yellowstone. To find other places to visit, reviews, photos, and other tourist information, read Yellowstone National Park trip itinerary planner. Traveling by car from Glacier National Park to Yellowstone National Park takes 9.5 hours. Alternatively, you can do a combination of flight and bus; or take a bus. Plan for slightly colder temperatures traveling from Glacier National Park in June, with highs in Yellowstone National Park at 20°C and lows at 0°C. Finish your sightseeing early on the 16th (Fri) so you can travel to San Francisco. Kick off your visit on the 16th (Fri): take a leisurely stroll along Fisherman's Wharf. On your second day here, get to know the fascinating history of Twin Peaks, head off the coast to Alcatraz Island, and then get to know the fascinating history of The Embarcadero. To find other places to visit, traveler tips, and more tourist information, go to the San Francisco trip planner. You can do a combination of bus and flight from Yellowstone National Park to San Francisco in 8.5 hours. Other options are to drive; or take a bus. The time zone changes from Mountain Standard Time to Pacific Standard Time, which is usually a -1 hour difference. While traveling from Yellowstone National Park, expect a bit warmer days and warmer nights in San Francisco, ranging from highs of 25°C to lows of 14°C. Finish your sightseeing early on the 19th (Mon) to allow enough time to drive to Yosemite National Park. Your cultural itinerary includes sights like Vernal Fall and Glacier Point. Eschew the tourist crowds and head to Bodie State Historic Park and Olmsted Point. 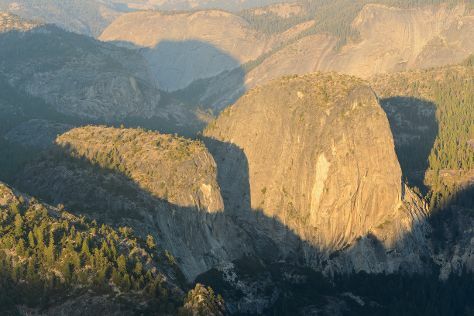 Spend the 21st (Wed) among the memorable landscape of Half Dome. The adventure continues: take some stellar pictures from Tunnel View, admire the sheer force of Bridalveil Fall, and make a trip to Valley View. For other places to visit, more things to do, maps, and more tourist information, go to the Yosemite National Park vacation trip planner. Traveling by car from San Francisco to Yosemite National Park takes 4.5 hours. Alternatively, you can take a bus; or do a combination of flight and bus. Traveling from San Francisco in June, expect nights in Yosemite National Park to be slightly colder, around 5°C, while days are somewhat warmer, around 29°C. You will have some time to spend on the 23rd (Fri) before leaving for Big Sur. Start off your visit on the 24th (Sat): enjoy the sand and surf at Pfeiffer State Beach, then take in the dramatic scenery at McWay Falls, then stroll through Julia Pfeiffer Burns State Park, and finally trek along Partington Cove. To see where to stay, photos, other places to visit, and tourist information, read our Big Sur online itinerary creator. You can drive from Yosemite National Park to Big Sur in 6 hours. Alternatively, you can take a bus; or take a train. Expect a bit cooler weather when traveling from Yosemite National Park in June: highs in Big Sur hover around 22°C, while lows dip to 13°C. 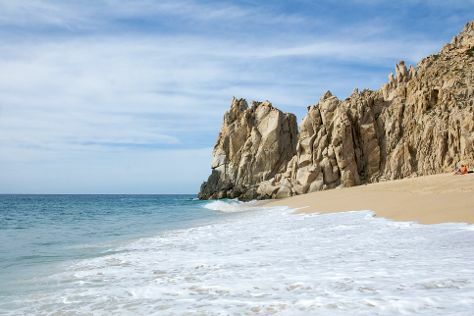 Cap off your sightseeing on the 25th (Sun) early enough to travel to Cabo San Lucas. Your itinerary includes some good beach time at Playa del Amor (Lover's Beach) and Medano Beach. You'll explore the less-touristy side of things at Chileno Beach and Marlin Alley. The adventure continues: see what you can catch with a fishing tour, kick back and relax at Playa Migrino, and soothe aching muscles at some of the top local wellness centers. To see traveler tips, reviews, other places to visit, and tourist information, use the Cabo San Lucas trip itinerary planner. The Route module can help you plan travel from Big Sur to Cabo San Lucas. Traveling from Big Sur to Cabo San Lucas, you'll lose 1 hour due to the time zone difference. Traveling from Big Sur in June, expect Cabo San Lucas to be warmer, temps between 36°C and 28°C. Wrap up your sightseeing by early afternoon on the 30th (Fri) to allow time for travel back home.